Facebook has struck a deal with Odeon that will let movie goers buy tickets without leaving the social network. 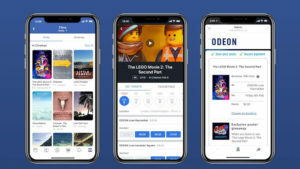 As part of the partnership, Facebook has launched a ‘Films’ tab in its app and online that will enable fans to book and pay for the tickets via Odeon. Tickets for screenings at other chains, including Vue and Cineworld, can also be purchased using the new service. The move follows on from a similar scheme with Odeon’s parent company AMC, which launched in the US last year. “There are millions of people around the world already interacting with film-related experiences on our platform every day, and UK cinema admissions hit a record high in 2018,” said Anna Higgs, Facebook’s head of entertainment, explaining the collaboration. By baking the buying feature into the use experience, Facebook will be able to glean some data on the kind of movies users are interested in – a potentially useful feature for advertisers. Odeon will also benefit from more seamless interactions with consumers and higher visibility online. Facebook rival Snapchat, first got into the movie ticket business in 2016, and claims it’s responsible for up to 50% of cinema ticket sales in the US.